Origin and Habitat: Garden origin (Nursery produced cultivar) The first plants sold on the market was offered by Chinese growers. 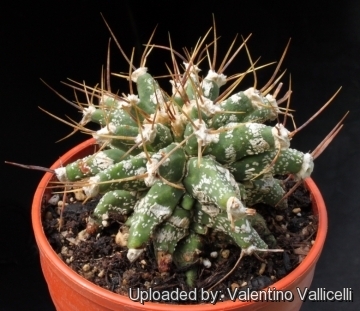 Description: Astrobergia is a strikingly weird but nice hybrid cactus (arguably) obtained by crossing Astrophytum ornatum x Leuchtenbergia principis (or vice versa?). Its stem is covered by more or less dense (depending on clone) white flecks that cover distinct odd tubercles. The superb features of this rare plant is due to the intersection between the traits of the ancestors. 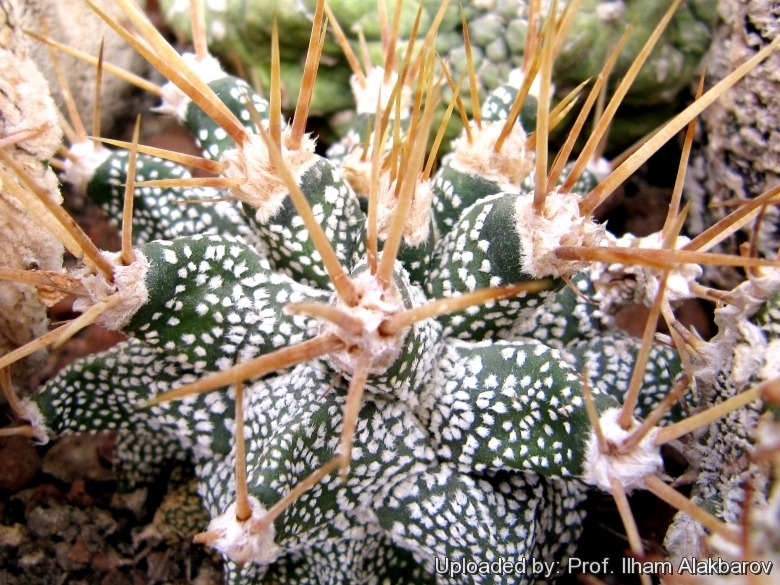 It has inherited by Astrophytum ornatum the dotted epidermis and the needle-like straight spines, but the spines are often longer, and by Leuchtenbergia principis the ribs divided in conspicuous conical tubercles, but tubercles are much shorter. The stem is solitary and often fails to produce offsets even if it has had its top cut off to encourage the formation of a crown of branches. The flower reminds those of the Astrophytum ornatum. Some of these "Astrobergias" looks like Astrophytum ornatum and could be a mutation much like the Astrophytum myriostigma cv. Lotusland, but much larger and robust with longer tubercles. 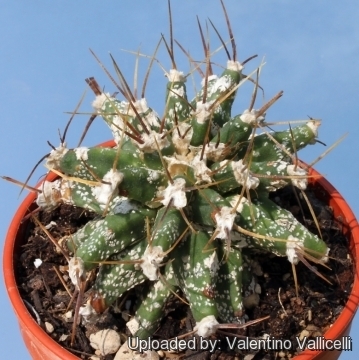 This plant can also been confused with Astrophytum ornatum cv. Kikko which is very similar (if not the same?). Cultivation and Propagation: Astrobergias are regarded as choice and difficult in cultivation, but despite that they are relatively easy to grow. They are usually seen as grafted plants, but they are able to grow on their own roots, but slow growing. Watering: Water sparingly from March till October, and keep perfectly dry in winter, at temperatures from 5 to 15 degrees centigrade. In the rest period no high atmospheric humidity! !Care must be taken with watering as they tends to become swollen and untidy in growth habit if given too much water and shade. Exposition: Outside bright sun, filtered sunlight or afternoon shade, inside it needs bright light, and some direct sun. Subject to sunburn if exposed to direct sun for too long. Tends to bronze in strong light, which encourages flowering and heavy spine production. Hardiness: Reputedly sensitive to frost, but less so if kept on the dry side prior to, and during, cold weather (hardy to -5° C for short periods). However some warmth throughout the year will increase the grower's success (minimum 5° to 8°C during rest season). Propagation: By seeds, grafting or cutting. Seeds germinate in 7-14 days at 21-27° C in spring, remove the glass cover gradually as the plants develops and keep ventilated, no full sun for young plants! The seedlings should not be disturbed until they are well rooted, after which they can be planted separately in small pots.